BlackPeopleMeet.com is dating site for black singles or for people who want to meet someone who is black. They provide live chat, email, match suggestions, and a dating magazine. You'll need full membership to access email. One of the biggest dating sites for black singles. 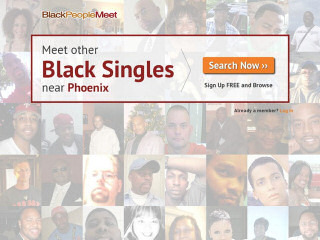 They say they're the #1 dating site for black singles. They have around 349,000 active at any time. Once you get in you'll find everything you'd expect from a dating website. However access is very restricted until you upgrade your account. BPM has people from all nations and walks of life. After the sign up, you can create a photo ad and then browse the profiles of others. Free members can't access their mail box until they upgrade. A membership upgrade gives full access to everything. This includes email, instant chat, videos and viewing interest from others. There's also an app that you can use if you prefer mobile. The site is fast and easy to navigate. My only nag is that if you have a free account you will get directed to the "signup page" whenever you try to access a premium feature. The searching option helps you find compatible matches. For premium users it shows who is online and who has viewed or bookmarked your profile in the last 10 days. When you come across a profile that you like, you can send a 'flirt' to let them know you are interested. One of the only way free members can show they are there. This makes for a fun and lively atmosphere. The live chat allows for quick contact and conversation. But again this requires an upgrade to premium. Blackpeoplemeet.com is fun, easy to use and navigate. The regular signup specials make it one of the most affordable dating sites around. Despite its name, blackpeoplemeet.com has many nationalities and races in the profile pool. They are well-established and are in no way exclusive. All races are welcome to join. Rss Feeds. Subscribe to comments for this site. [?] Receive updates about Blackpeoplemeet.com directly through your newsreader. I am single, well educated, great position, and have an outstanding work record. College educated, above average in appearance, well dressed and can hold a wonderful conversation about most subjects. I am good company , masculine, and not a " Diva Dude". I have always placed my ladies needs above my own....so why is it that a well put together man has such a horrible time on this site. I have left, returned, and left again, and returned once again. Match.com, E harmony and others really are just for caucasions and most certainly not for an African American male. I simply would like to meet a beautiful active Black woman for serious relationship. It appears this is not the place. Replied to mudcreek Well my brother. You can bypass all the dating sites and get in touch with this sister. I am considering joining a dating site but might have to just let serendipity take over. Most reviews I've read of ALL the various sites are hit or miss. But it guess that's the way it is in real life as well. Oh well, good luck in love and friendship! I have been on this site for over a year and have never had a date. I do not get anymore flirts or anything. I will not be returning. The men on here play too many games. They send me flirt and when I send one back there is no reply. This site is horrible. It is not worth the money. When I read some of the comments on here it is funny to me. The complaints women have about men I can say women do the same things. Women complain about men sending flirts? I can't tell you how many flirts I've gotten from women! Women say men lie about their real appearance or post old photos. OMG, you won't believe how often that happens to us guys too! Women say the men lie too much. WOW, are you kidding me? I have been lied to on a few occasions. I even went on a date with a woman whose profile said she had "zero" kids and turns out she really had FOUR! And of course we love the women who say they are a "few extra lbs", when they are like 80-100 lbs overweight. Women say the men don't have jobs? I can say the exact same thing about some of the women I have talked to on BPM. Trust me the recession didn't just affect men! There are plenty of women whom have gotten laid off too. So ladies, before you get so down on the guys, you all need to realize it's no picnic on our side of the fence either. I appreciated Logi's story (post from April 10, 2011). Men often leave the fact that they are married out of the conversation, and that's really sad. However, I can't understand why she would believe that a man she met on the internet with a name like Issac Hayes was serious unless that bad mothafu(shut yo mouth) showed some ID. How is this site not racist??? What if I started a site for only Mexicans? Whites? Am I not allowed to date a black woman? Give me break. I sell real estate in Arizona and what if I only sell to one race? I'm happy to discuss this with anyone. Racism describes societal patterns that impose oppressive or otherwise negative conditions against identifiable groups on the basis of race or ethnicity. BPM is not racist just because of its name. Racism is when one race deems itself to be superior in comparison to other races and uses its power to oppress other races of people. Are black people oppressing your race of people? Don't hate because blacks log on to a website to meet and greet. BPM is owned by whites. Stop hating and learn what institutionalized racism really is. Replied to MIMI_4874 @MIMI Mimi, there are sites for whites only. They are called Eharmony, Match.com, Yahoo etc. All these sites where the average black woman is ignored. BPM doesn't ban white ppl or anyone. They make it possible for black and those that love black people to interact freely without feeling ostracized. If you can call that racist, then you must have been on the site and gotten no hits. Poor baby. Replied to PasserByer @Passer Byer First of all, you need to change the words 'black girls and black guys' to African American men and women. When reviewing articles about white dating sites you don't see the words "white girls and white guys" now do you ? Replied to DUSTINWALTERS @DUSTIN WALTERS From Silvia, Black People Meet is not racist. If you wish to meet a Black women/man just go on the site and look at all the beautiful black women/men you can meet. Just because it has the title "Black People" doesn't mean others can't use the service. Mexican stores have Mexican names, Jewish stores have Jewish names, etc. This entity just chose to call the site Black People. I really liked black people meet... and I'm embarrassed about my story, but here goes. When I first registered to the website, I loved it. Black people meeting and greeting, I enjoyed all the emails. I eliminated some of my admirers and remained in contact with two males. The male that I really connected with, lived in my area. He marked his status as "single and looking for a serious relationship". So I was excited to meet him. We met and went on a nice date to a movie. Things progressed within the month as we continued to see each other. One day I received an email from his wife threatening me to leave him alone, so I did. Months passed and just as summer came around, I noticed this man driving past my house several times as I was leaving out. He called me and said he was no longer with his wife, but I told him the only way we could go out again is if he could prove his marital status. I did a Google search on this guy and found an article or transcript from dateline MSN... a transcript from the Count Down with Keith Olbermann Show. It appears that several women complained about this man on DontDateHimGirl.com. In the transcript Keith Olbermann is interviewing the owner of DontDateHimGirl.com. In the interview, she explains that several women have complained about this particular man.. His name is Isaac Hayes and he goes by other names like Josias West. He pretends to be Jamaican/Rastafarian. I just feel the site attracts married men, and it's shocking to know these men are willing to pay monthly fees just to play around with women. I'm sure there are good men on the site, but the bad ones need to be gutted out. I haven't been back to Black People Meet in 4 years. Don't bother. A big waste of time. Nothing but a bunch of broke unemployed brothers trying to mooch off women because their mother never taught them better. Save your money. USCGRAD1989, search him and don't bother. The biggest liar of them all! BlackPeopleMeet 2.09 41 A review of BlackPeopleMeet. BlackPeopleMeet.com is dating site for black singles or for people who want to meet someone who is black. They provide live chat, email, match suggestions, and a dating magazine. You'll need full membership to access email.